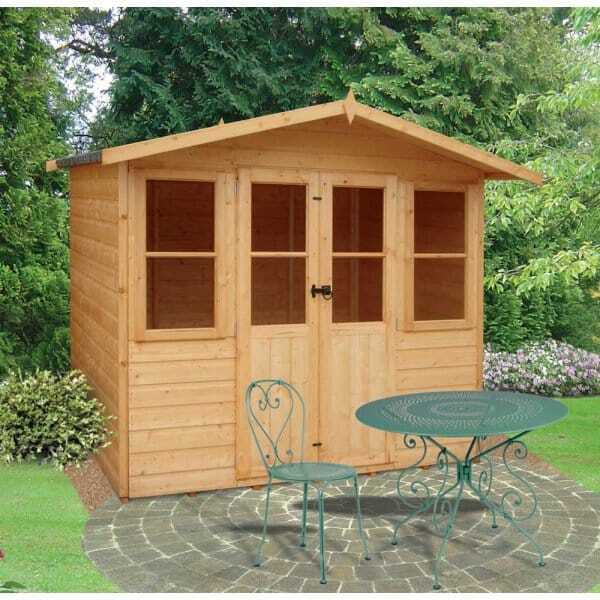 The Shire Haddon 7x5ft Summerhouse including includes the highly attractive Double Doors featuring glazing approx 3/4 of its height with a wooden panel at the bottom and the roof canopy as shown. The Shire Haddon offers a mid sized, excellent value summerhouse that is in easy to manage sections and is straightforward to build. Review - Overall happy with the product. The only 2 complaints I have are. 1. Wrong size glass on receipt replacement glass all broken spoke to your customer care who said that they would out source some in my local area and let me know where I can collect it from I never hear from them. I went and sourced it myself at a cost of £15 as I needed to secure the summer house as I was going away. 2. The instructions are very poorly produced and had job to read this needs to be looked at. 2. The instructions are very poorly produced and small text hard to read this needs to be looked at.